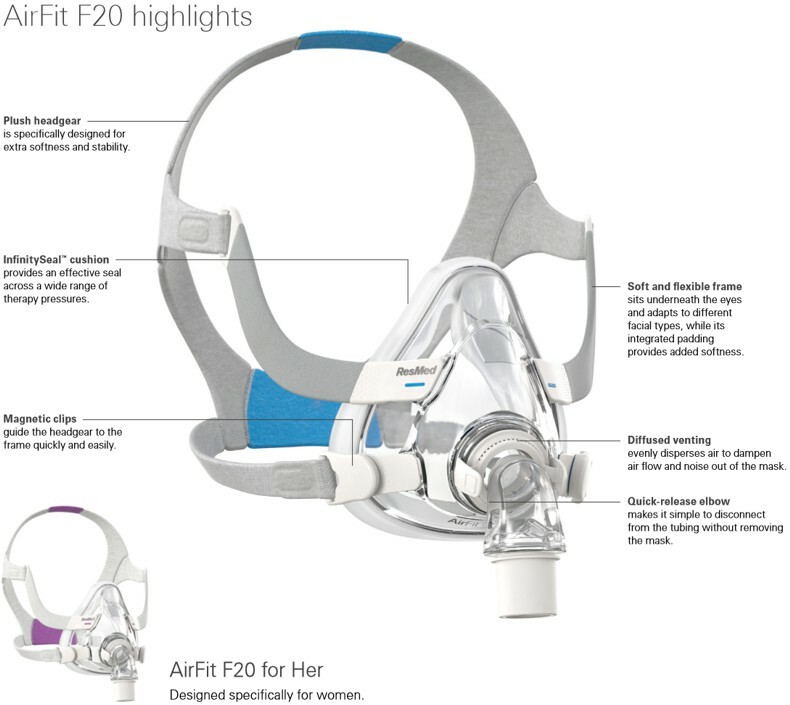 The AirFit™ F20 is ResMed's most technologically advanced full face mask yet. It features the InfinitySeal™ cushion, which effortlessly adapts to different sleep positions throughout the night while providing a reliable seal. Its simple design with magnetic clips and a quick-release elbow makes it easy to use and reassemble after cleaning. Full face benefits in a compact size. After more than 25 years of ResMed masks featuring dual-wall cushion technology, we’re excited to introduce InfinitySeal™ cushion technology. This new cushion features specially-designed “infinity” loops and varying thickness levels designed to reduce blowout and provide support at the sides of the nose. I have ordered this before, but now it is slightly longer (taller?) and goes all the way up between my eyes, causing a friction blister. It is not overly tight, and I use a bandaid as padding, but the problem persists. This is why I went back to this model from the cheaper version, but I guess they changed the style. I have been very pleased with the service I have been getting from CPAP - Supply and I will continue to purchase my supplies from them. When ever I call them Andrew has always been very pleasant and friendly I could not ask for any thing more in service. It is just what I needed. I appreciate your fast service. Once I figured out how to fit the pieces and adjust the fit of the mask - it's performance is exceptional. It is so comfortable I don't pull it off during the night. It truly lives up to it's promotional materials. trying a different mask for first time. order was promptly processed. mask fit perfectly. love the new model.